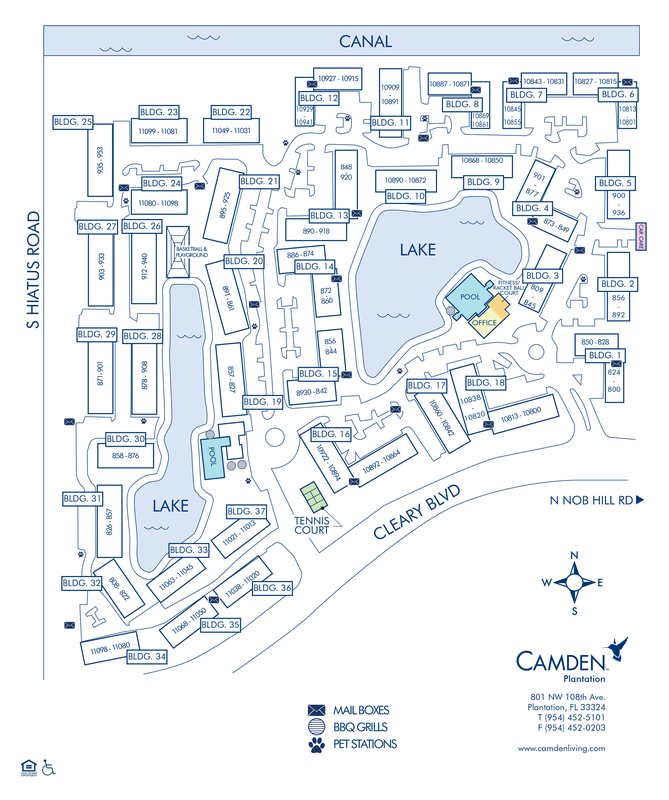 Camden Plantation's one, two and three bedroom apartment homes in Plantation, Florida provide a sense of community and is walking distance to everything you need. You will love the amount of space in our available floor plans. Our apartments include vaulted ceilings, spacious open-concept kitchens, and full-size washers and dryers. Some apartments have attached garages and detached garages are also available for rent. Walk your dog in our beautifully landscaped, pet-friendly community and enjoy panoramic lake views. Entertain your friends at either of our two lakeside swimming pools with outdoor grills and picnic areas, or have some fun in our indoor racquetball court. Tennis enthusiasts will enjoy our lighted tennis courts and the kids will love our onsite playground. Get moving with a cardio workout in our 24-hour fitness center or break a sweat on one of our walking and jogging trails. Central Park Elementary school is rated a 9 out of 10 with a 5-star community rating and is across the street! Plantation Sunset Park has seven lighted baseball diamonds, two of which are major league regulation size, and four T-Ball fields. The park also has two playgrounds, a pavilion and a walkway that surrounds the fields. Stock up on groceries from Publix or Winn Dixie located adjacent to our community. Feel like shopping? We are only 3.1 miles to the Sawgrass Mills Outlet Mall or hit the links at Jacaranda Golf Club and Grande Oaks Country Club - where the legendary Caddyshack swimming pool scene was filmed! Close proximity to Sawgrass Expressway/ I-75 and I-595 make for an easy commute to Boca Raton, Fort Lauderdale or Miami. With so much at your fingertips, Camden Plantation is the right choice for you! Call today to make an appointment and come home to Camden Plantation. Guests must be registered at the office to park in the community. Detached Garages are available to rent for $125 per month. Please speak with the leasing office for further details.